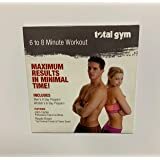 Each Total Trainer comes with exercise cards that allow you to personalize and track your training program. You select the programs that meet your needs ...from the Warm-up/Cool Down Program to the Total Body Circuit Program. 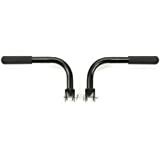 m) Maximum User Height 6' 7"
A four-point pulley system allows smooth, fluid movement. 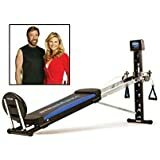 The Bayou Fitness Total Trainer 4000 XL offers an ideal way for both men and women to strengthen and tone their bodies while improving flexibility. 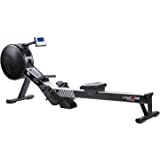 The device utilizes your own body weight for resistance training, eliminating the need for a room full of heavy weights and helping you achieve a lean, toned physique. 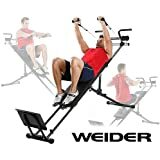 You can adjust the percentage of body weight lifted, from 4% to 69%, by moving the incline up or down, providing safe and effective results. With 14 custom programs, you can select the programs that meet your needs, from warm-up to cool-down. 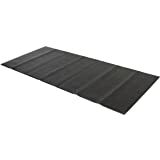 The durable device has a 385-pound user capacity with 11 levels of resistance, while a Super Tuff Roller System delivers an exceptionally smooth ride. 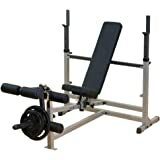 Power weight bar: Allows you to add standard free weights to the Total Trainer, increasing resistance while performing exercises such as leg squats, calf raises, etc. 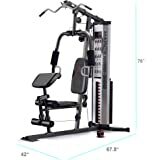 This piece of Bayou Fitness equipment includes limited manufacturer's warranties against defects in materials and workmanship of one year on parts. You can't beat working out at home. After ten years' use from my Total Trainer 3000, it was time to replace it. The 4000-XL is pretty much the direct equivalent to that excellent machine. 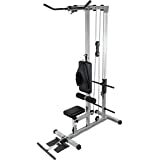 It's a great machine for strengthening and toning, and good for muscle building with its high weight capacity. I've been using it nearly three months, 3-5 days a week. - Key components do not seem as well built as my old 3000. The locking handle and a pulley attachment handle both broke recently. Also, while the glide board seems much smoother than my old machine ever was, it doesn't align as well side-to-side, often resulting in a slight drag on the rails. I'll update this review after I see about replacements. The Trainer arrived earlier then it was forecasted. The unit itself actually contained more accessories than listed in its description on the web site and appears to have contained future accessories that will be offered. I have a bad back and problems with a botched operation on my spine and am not able to walk and stand for any appreciable time. 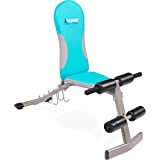 I bought the unit because the exercise equipment I had were mostly for strength training and were not of much use to help my problems. 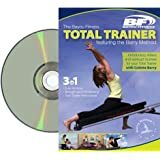 Since the trainer has a much more flexible exercise regimen , with more motion involved than my prior Marcy home gym , I have been able to increase the amount of time I can stand and walk with reduced pain. I am hopeful that my continued use will increase that time substantially. 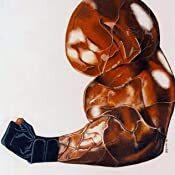 Years ago (1970's) I bought and used the original total gym,( yes I am over 70 years young ) , the Bayou Fitness Total trainer offers much more in additional accessories and added exercise regimens at a substantially lower price. I would definitely recommend this unit for the type of physical problems I am presently experiencing. The unit is easy to fold up and minimize its foot print when not in use. 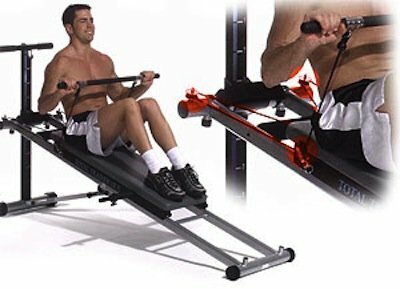 You get a great workout on this equipment. 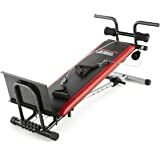 You can do MANY different upper and lower body workouts on this. The glide board is HUGE and WIDE! It's easy to set up and I like that you can add weights to it as well. The only reason I'm giving this 4 stars instead of 5 is because my very first pull made the cheap pin insert bend; and the ropes, wheel, and metal parts all came out at me with full force! Not pleasant! Make sure that pin is secure before you pull. It does not lock into place very securely. I was also surprised that it had a few plastic parts that should definitely be made more durable for this otherwise solid built equipment. Overall, I would say Go For It, you won't be sorry. Make sure you have plenty of room for it because it is very big. 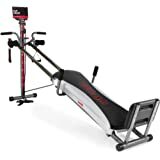 I have a home gym and it's a GREAT addition! 2.0 out of 5 starsLittle things have added up to a just okay experience. It doesn't slide well in the lowest settings. At the risk of injury, I've started at a more advanced weight because of this. Also the black, plastic clamp that holds it in its closed/folded position came broken. When I close it I just lay it down. It's a little thing but it still pisses me off and my schedule would have made dealing with a return even more upsetting. So it takes up more floor space when not in use because of this. Otherwise it's decent equipment I guess. Though it seems a tad too pricey for all I've experienced. 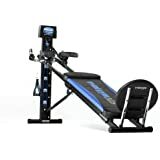 4.0 out of 5 starsAccessiry to prevent pullung my self off Total Trainer 4000 XL? 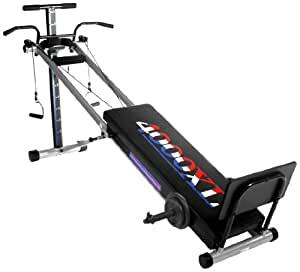 I am very happy with my Total Trainer 4000 XL. 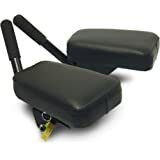 I find that having added 100 lbs to the slider, I can do a wide variety of exercises without having to change the weights, just by changing the slider angle setting, which is very easy. I am having one issue. I do inclined pullups (without the cable), and find that on the highest setting (11) with the 100 lbs added to the slider, I pull myself along the slider, which stays at the bottom of the rails. Is there some accessory that can be used to prevent this? A strap or something? This arrangement (level 11 with 100 lbs on the slider) is required to approximate doing real pullups at my full body weight. 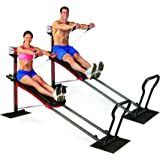 After two Total Gyms over the years the Total Trainer is the new replacement and it does not disappoint. 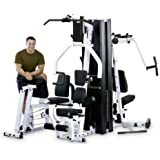 It is a sound piece of equipment with lots of handy accessories to get a full workout. Regrettably, after it was shipped a significantly lower price was found at another website for the same new 4000xl other than Amazon. Before it was delivered I looked into returning the higher priced one, but of course the penalties were too heavy to bother. Nice piece of equipment, but shop around.